The plot to transform the San Francisco Bay Area into a political “Region” is largely unknown by the residents living there and overwhelmingly opposed by those who do know. The global boiler plate program called One Bay Area (OBA) or Plan Bay Area will roll out across the nation on a grand scale. OBA involves more than $250,000,000,000 (over a quarter of a trillion dollars). The plan destroys rural and suburban lifestyles and transforms areas into dense mega-cities where people are assessed, monitored and controlled. Sound extreme? 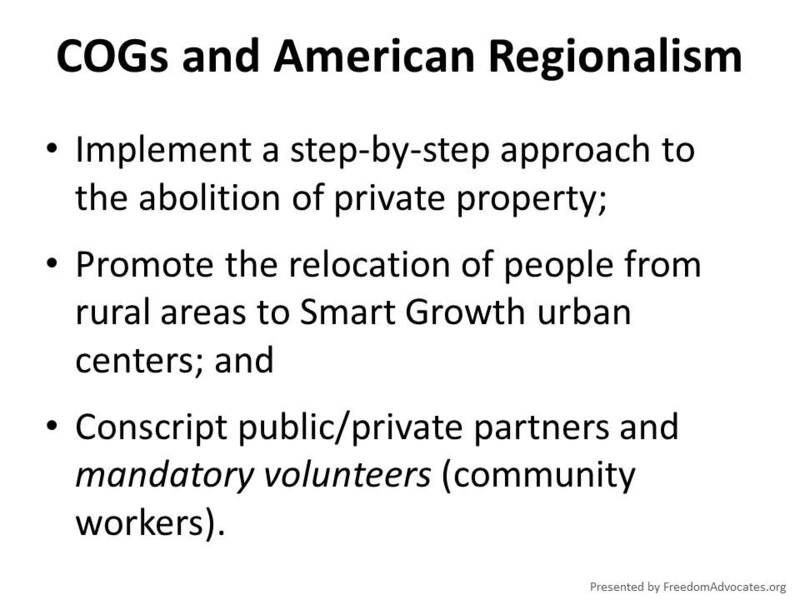 Regional government is promulgated through Councils of Governments (COGs) and serves to neuter local government through a federalized system of carrots and sticks. 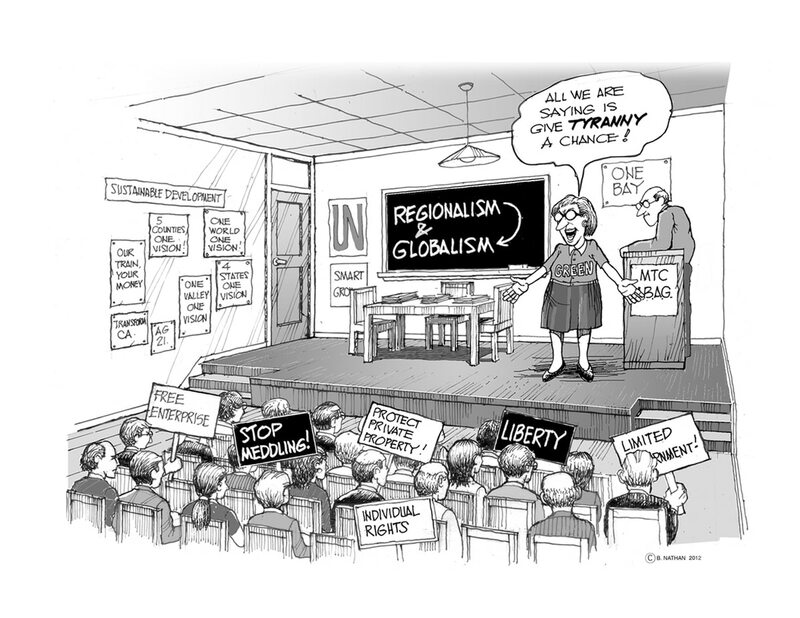 COGs are designed to be the primary engine in the United States to advance Agenda 21 at the local level. The Plan for the San Francisco Bay Area is the prototype of what COGs throughout the country will commit to if the Plan is implemented in the Bay Area. Over time the Plan abolishes private property as a system of public private partnerships assume control of our economic future. Michael Shaw of Freedom Advocates and Rosa Koire of The Post Sustainability Institute are spearheading a lawsuit to block the implementation of Plan Bay Area, an agenda created by the Association of Bay Area Governments (ABAG). The lawsuit challenges the Plan on the basis of Constitutional and/or statutory violations inherent in the Plan. These include state and federal equal protection violations, and violation of the state constitutional guarantee that each city and county has autonomy from coercive state control and regionalist philosophy. 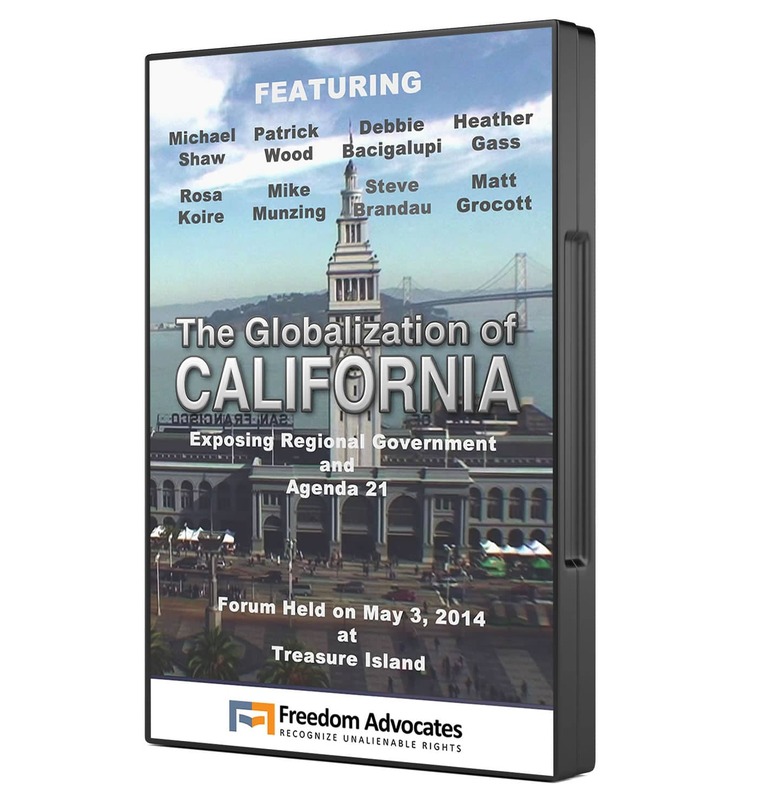 Article XI of the California State Constitution guarantees city and county autonomy, and the 14th Amendment of the Federal Constitution guarantees equal protection. 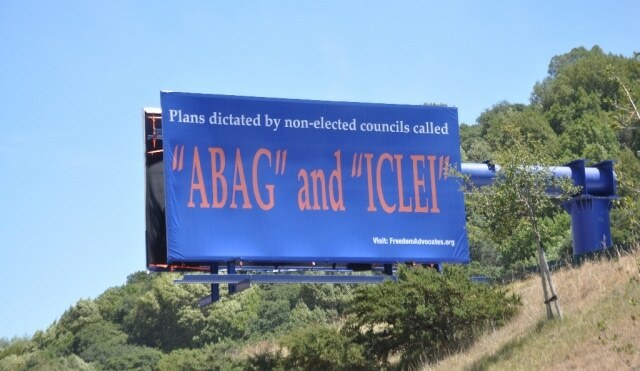 These guarantees are violated by the restructure of government advancing through ABAG’s Plan Bay Area. On February 25, 2019, the California Appellate Court, after sitting on full briefing for three years, mooted our lawsuit claiming ABAG had modified the Plan so that the case could not be assessed. 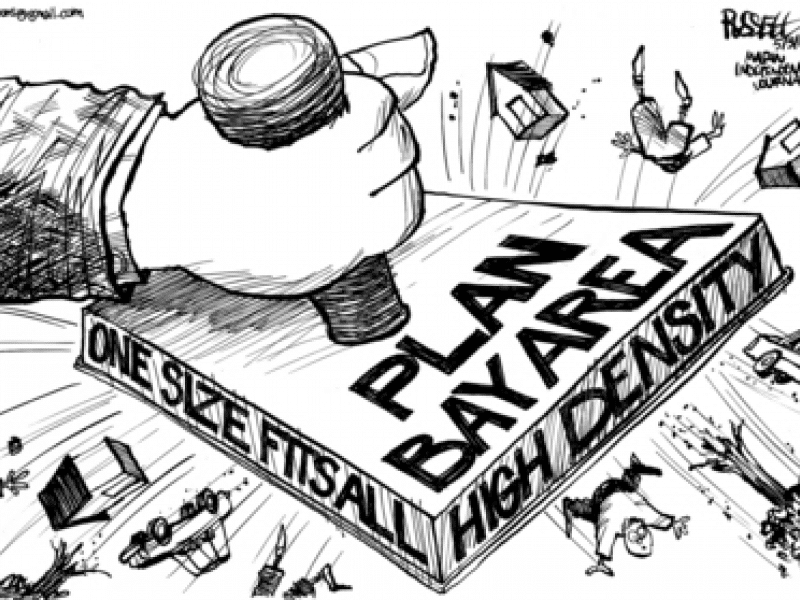 The unpublished decision held that since “Plan Bay Area” was updated with “Plan Bay Area 2040” in 2017 that the new plan has not been briefed for the court, thus rendering the case moot. By state law, the plan required a “limited and focused” update every four years. The substance of the update was limited. 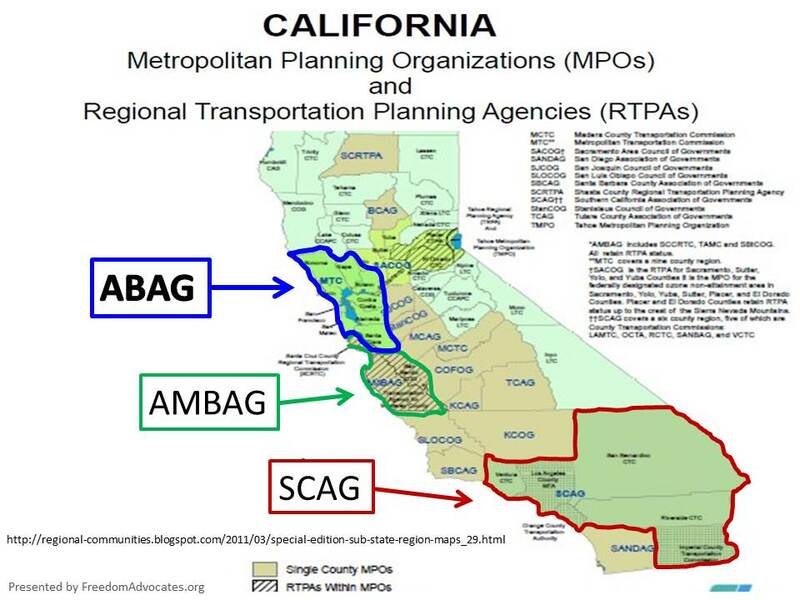 The primary change regarded the financing, as the Metropolitan Transportation Commission (MTC) now partners with the federally created ABAG — a COG and member of NARC, the National Association of Regional Councils. 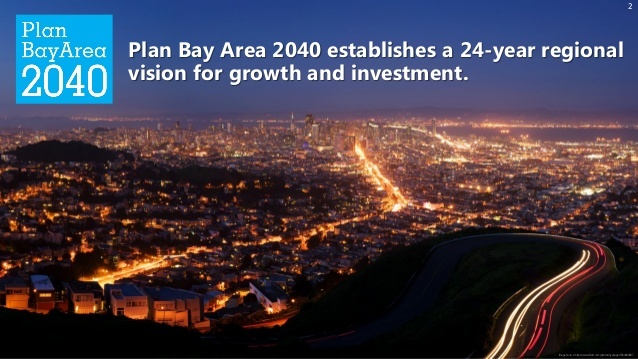 MTC will provide the massive federal funding necessary to remake the Bay Area pursuant to Plan Bay Area 2040. MTC is also a federal entity. There is a MTC in each metropolis in America. Ever studied a Soviet? The American centralized soviet is more perfected than the Soviet Union ever was! One can now expect this prototype to spread to the Los Angeles and San Diego COGs and then to COGs across the country. Read the Court’s ruling here and our request for reconsideration here. The structure of government is the issue raised by our lawsuit. The Court is facing a tough decision, because to do the right thing, it has to neutralize AB 32 and SB 375, and neutralize ABAG — the COG creating the prototype designed to globalize America through unelected and unaccountable councils. The issue raised in our lawsuit is the issue of the day for the state of California — it is the most important political issue ever raised in the state of California. Longtime ABAG leader and Alameda County Supervisor Scott Haggerty battles Michael Shaw at Board of Supervisors meeting. Implementation of One Bay Area/Plan Bay Area is not rolling forward very swiftly. Some cities have taken no action — other than rezoning in order to receive payments from ABAG. But in many of these cities, no steps have been taken to implement the revised zoning, indicating that these cities are not supportive of these changes. Some cities are acting as if they won’t do it, other cities are intentionally not doing it. Because there is no clear direction from the state, cities are in a bind. Plan Bay Area implementation has been stymied. Evidencing the fact that ABAG implementation of Plan Bay Area has somewhat faltered is an article in the Mountain View Voice. Mountain View is fully integrating Plan Bay Area, but many Bay Area cities are not. Plan Bay Area’s detachment from any mandatory land use policies wasn’t enough to assuage concerns from Brisbane city officials, who showed up in full force at the July 26 meeting with frustrated demands to revoke the housing projections for the small city south of San Francisco. Plan Bay Area projects that a massive 684-acre baylands site located in Brisbane could accommodate 4,400 new homes, but city officials say it’s hardly a done deal and simply one proposal by the developer who owns the property. “On the one hand, we’re told that Plan Bay Area doesn’t dictate local land use, yet on the other hand, it appears that the city could be financially punished for exercising our local land use in a way that displeases MTC,” Davis said. Brisbane’s Mayor Pro Tem Clarke Conway called the growth expectations for the city “ludicrous,” and demanded the joint agency’s executive committee members delay a vote on Plan Bay Area and its environmental impact report until after the city’s decision on the baylands project in late August. Scott Lane, a member of MTC’s policy advisory council, said he fully embraces Plan Bay Area and understands the Bay Area is already be something close to 300,000 housing units behind on new demand, but said putting such a heavy burden on one city amounts to “utter insanity” that puts MTC at risk of a lawsuit. Palo Alto’s Scharff said he believes the fears over Bay Area’s growth projections are “misguided,” and that the real threats to local control reside in Sacramento. The state legislature has proposed close to 130 different bills aimed at addressing the state’s housing shortage, and some aim to limit the ability of local governments to slow down or block approval of housing developments.